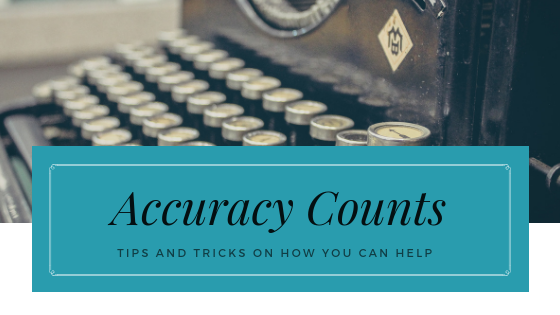 Everyone knows the importance of accuracy during events like elections or medical procedures, but have you ever given thought to the importance of accuracy in your transcribed depositions and meetings? Court Reporters face many challenges during the transcription process that can affect their accuracy. Here are a few common challenges and some ways that you can help your reporter create the most accurate transcript possible. Unless you are ok with many [inaudible] comments throughout your transcript, make sure you stress that witnesses speak clearly and loudly. We understand that everyone is in a hurry, but a deposition should not be rushed. When you ask your reporter to make an exhibit, be sure to allow a pause before continuing with questioning. It is not necessary to speak punctuation like quotes, your reporter will be forced to type the actual word out in your transcript. If quotation marks are necessary, your reporter will fill them in as needed after the deposition. This one seems like common sense but often the middle of a discussion we can forget and attempt to talk over each other. Your reporter cannot accurately capture more than one person speaking at a time. Choosing the right reporting service is an important key to accuracy as well. Our team of MGR Court Reporters is dedicated to providing you with the highest quality transcripts, whether it’s in the courtroom or during depositions, arbitrations, mediations, or conferences.